PESHAWAR: Terming Maulana Fazlur Rehman the ‘Pharaoh of Bannu’, PTI chief Imran Khan told his supporters at Bannu that he had decided to contest polls from Bannu to defeat the self-styled ‘monarch of Bannu’. “You all know about his [financial] position before he ascended to power by way of his party’s government in Khyber-Pakhtunkhwa in 2002. Now, he is a multi-billionaire,” he maintained. According to him, Akram Khan Durrani and Maulana Fazlur Rehman’s financial position had substantially improved but Bannu’s position remained the same. 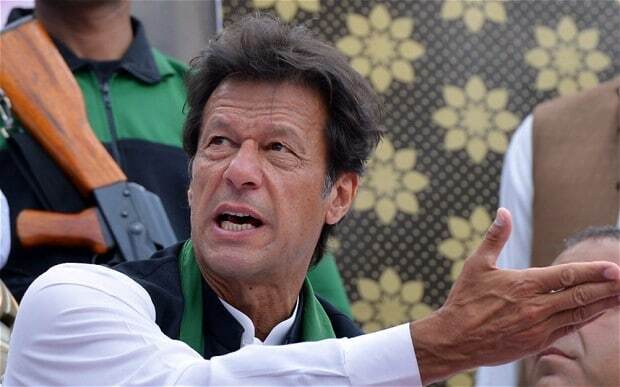 Speaking to a crowd of thousands of his party’s supporters, the PTI chief conveyed a message that his contest with the Bannu’s Akram Khan Durrani was not a one-sided affair. Imran Khan is contesting from NA-35 Bannu against the former chief minister of the province and JUI-F stalwart Akram Khan Durrani in the general election. Mobilising public support for his party’s candidates, Imran’s speech was removed from his routine diatribe. It was more focused on comparing the achievements of the PTI-led government with those of other parties in Sindh, Punjab and Balochistan. He started off his speech by thanking the people for making his rally successful notwithstanding the sweltering heat. Urging the people to ask both Durrani and Maulana Fazlur Rehman about the burden of foreign loans which befell Pakistan during their time in power, he said that the country’s foreign loans had now swelled beyond Rs13 trillion. “Tell Durrani that you were Nawaz Sharif’s partner when he and his party came into power and one US dollar was worth Rs100, but now it was rated at Rs125,” he asserted. Pakistanis, he said, got poorer and they (Durrani and Fazl) became rich. He accused both of stashing their money in dollars and pound sterling. According to Khan, the electricity generated by the PML-N government was expensive against power tariffs in the entire subcontinent. An expensive dollar, he said, causes a surge in rates of natural gas, oil and subsequently electricity too. He said that the PTI government had built 300 small hydropower stations in the province, providing cheap electricity to people who previously suffered power 20-hour-long power outages. Urging Durrani to tell the people about why contracts signed by the PTI government for hydropower projects capable of producing 700MW megawatts were torpedoed. “I dream about providing free education to orphan children in government-run schools, allowing them to become business tycoons by virtue of their education and initiative,” he said. Reiterating his resolve to improve the quality of education in public schools, he highlighted steps taken by the PTI government in this regard. Imran Khan said that the PTI government had recruited 60,000 teachers, built 1,000 schools and upgraded 2,500 government-run schools. He said that he wanted to devise an education system that enabled a poor man’s child to become a rich businessman, but the system was hijacked by people like Akram Khan Durrani that did not allow poor people to progress. “If we compare police in K with police in Punjab and Sindh, we can safely say that KP police is the best. All cases are solved within a year because of legislation in this regard,” he said. According to him, KP also had the best education system in the entire country. PTI, he said, had also implemented the best local government system in the country. According to him, the local government system in KP was so good that people in other provinces wanted to emulate it. He claimed that his party’s government had planted 1.18 billion trees. Imran Khan said he also dreamt of transforming the justice system in the country that allowed a poor manual worker to confront a powerful person such as Akram Khan Durrani, restoring Pakistan’s dignity in the world.